LEO Learning and Godiva won the Best Game-Based Solution during DemoFest at the Learning Solutions 2019 Conference. 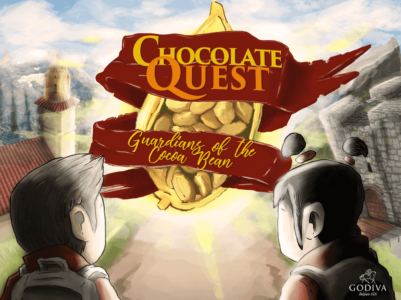 The honor recognizes the Godiva multi-level learning game ‘Chocolate Quest: Guardians of the Cocoa Bean’ that uses scenarios, microlearning, and character interactions to help players experience a direct relationship between knowledge, customer experience, and sales. "We’re delighted to receive another award, for our work with Godiva. We developed this as a learning game to inspire our learners around an amazing brand, deliver learning to them in a deeply engaging format, and drive real business results," said James Greenwood, Managing Director, LEO Learning. "To win this award through the peoples' vote at Demofest is even more exciting, as it is direct recognition from players and learners that we have created something deeply impactful." "Spanning the almost 4,000 year-old history of the birth and evolution of cacao, the Godiva Chocolate Quest Game brilliantly combines innovative graphics, challenging learning scenarios and fun facts to engage our global millennial sales force," said Karina Chiechi, Godiva’s North America learning and development manager. "To be able to bring this type of modern and visionary learning to an almost 100 year-old chocolate brand has been a joy and a career highlight for our Learning and Development team." LEO Learning believes that technology-enabled learning innovation has the power to deliver transformational results. Our purpose is to help clients deploy learning technology to deliver outcomes precisely aligned to their business goals. Backed by more than 30 years of experience, we design engaging learning architectures that fit seamlessly into businesses and improve performance throughout the entire organization. LEO Learning’s expanding global customer base includes organizations such as the NHS, Civil Service Learning, Jaguar Land Rover, Volvo, Suncorp, Fidelity, Virgin Atlantic, Novartis, Godiva, Volkswagen, Dunhill, KPMG, Roche and Mars. LEO Learning is part of Learning Technologies Group plc’s award-winning group of specialist learning technology businesses.